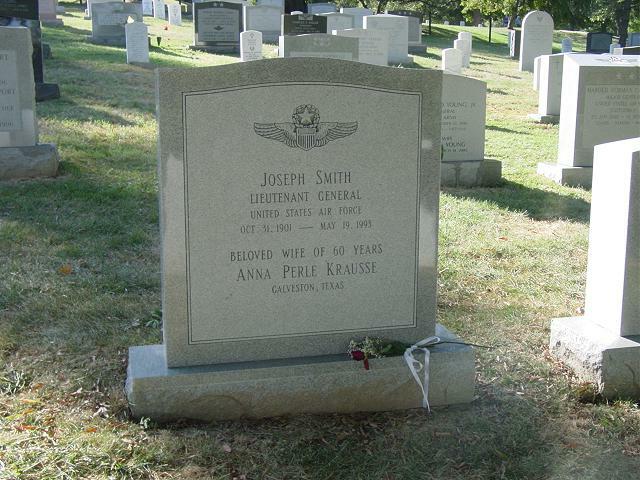 Air Force General Joseph Smith, a major figure in the Berlin Airlift, died on May 19, 1993 at the Andrews Air Force Base Hospital, Maryland. He was 91 and lived in a military retirement home at Fort Belvoir, Virginia. The cause of death was respiratory and heart failure. As an air transport commander and planner, he had important roles in the Korean War, the Suez Canal crisis in 1956 an the airlift of 14,000 Hungarian refugees from the uprising in Budapest that year. Born at Scranton, Pennsylvania, he graduated from West Point in 1923 and was commissioned in the Cavalry. In 1928, he completed flight training in Texas and headed the Cadet Corps at KellyField. He flew mail over the Rockies, joined a bomber unit and graduated from the Command and General Staff School. By the outbreak of World War II, he was on the General Staff of the War Department. As a senior planner in 1943, he accompanied President Franklin D. Roosevelt to the Cairo Conference to refine Allied strategy. After the war he was sent to Germany and led the Wiesbaden Area Command. In June 1948 the Russians cut off all road, rail and water links to West Berlin. The Allied began an airlift of food and fuel, and he was appointed to head the operation to sustain the two million West Berliners. The U.S. and British transports landed every few minutes at Tempelhof Field. On their return the planes flew out products of Berlin's factories. The Russians lifted the blockade in May 1949, six months after he had been reassigned to Washington. From 1951 until his retirement in 1958, he commanded the Military Air Transport Service, which ferries troops, their families and cargo for the Armed Forces. During his career he was awarded the Legion of Merit and the Distinguished Service Medal, both with an Oak Leaf Cluster. He died on May 19, 1993 and was buried in Section 7-A of Arlington National Cemetery, just a short distance from both the Memorial Amphitheater and the Tomb of the Unknowns. Joseph Smith was born in Scranton, Pa., in 1901. He graduated from the U.S. Military Academy June 12, 1923, was commissioned a second lieutenant of Cavalry and assigned with the Eighth Cavalry at Fort Bliss, Texas. In October 1924, he joined the Second Machine Gun Squadron at Fort Bliss, and subsequently became squadron adjutant. In November 1927, General Smith entered the Air Corps Primary Flying School at Brooks Field, Texas, and the following July transferred to the Air Corps Advanced Flying School at Kelly Field, Texas. He graduated in October 1928 and was assigned to the 40th School Squadron at Kelly Field. In December of that year he went to the Philippine Islands to join the 66th Service Squadron at Camp Nichols and the next month transferred to the Air Corps. In March 1931, General Smith was assigned to Brooks Field as post education and recreation officer. In October 1931, he moved to Kelly Field as education and recreation officer and in July 1932, assumed command of the Flying Cadet Detachment at the Air Corps Advanced Flying School. From March to May 1934, he served as a pilot with the Army Air Corps-Mail Operations at Salt Lake City, Utah, after which he returned to Kelly Field as an instructor at the Air Corps Advanced Flying School. He was named flight commander of the 42nd Bombardment Squadron at Kelly Field in February 1935. General Smith entered the Air Corps Tactical School at Maxwell Field, Ala., in August 1936 and graduated the following June. He then moved to Mitchel Field, N.Y., as a student officer at the Group Navigation School. After completing the course in November 1937, he remained at Mitchel Field as operations officer of the Ninth Bombardment Group. In September, 1938 he entered the Command and General Staff School at Fort Leavenworth, Kan. Upon graduation in June 1939, he resumed his duties as operations officer of the Ninth Bombardment Group at Mitchel Field. From July 1940, to March 1942, General Smith served at Langley Field, Va., and Bolling Field, D.C., as assistant to theassistant chief of staff for operations at General Headquarters Air Corps, and later as assistant to the assistant chief of staff for operations of the Air Corps Combat Command. His next assignment was as a member of the Strategy Section in the Operations Division of the War Department General Staff. In April 1943, he was made senior Air Force member of the Joint War Plans Committee, Joint Chiefs of Staff, and in January 1944, became chief of the Third Air Force at Tampa, Fla. In January 1945, General Smith Joined the 20th Bomber Command in India and the following March was appointed its chief of staff. In August, he became deputy chief of staff of the Eighth Air Force on Okinawa. General Smith, in 0ctobor 1945, was appointed assistant chief of air staff for plans at Air Corps headquarters. In November 1945 he became chief of staff of the Air University at Maxwell Field, Ala., and the following July was named deputy commanding general of the Air University. In August 1946, he became commandant of the Air Tactical School at Tyndall Field, Fla.
General Smith was appointed Headquarters Commandant of the U.S. Air Forces in Europe, with station at Wiesbaden, Germany, in November 1947. A year later he was assigned to the Office of the Deputy Chief of Staff for Operations at U.S. Air Force Headquarters in Washington, D.C., and in December 1948 became chief of the Plans Division in that office. The following September he was appointed deputy director of plans and operations in the same office, with additional duty as the Air Force member of the Joint Strategic Plans Committee of the Joint Chiefs of Staff. In July 1950, the director of plans and operations was split into two directorates, and General Smith became director of plans in July 1951. The following November he assumed command of Military Air Transport Service at Andrews Air Force, Md. 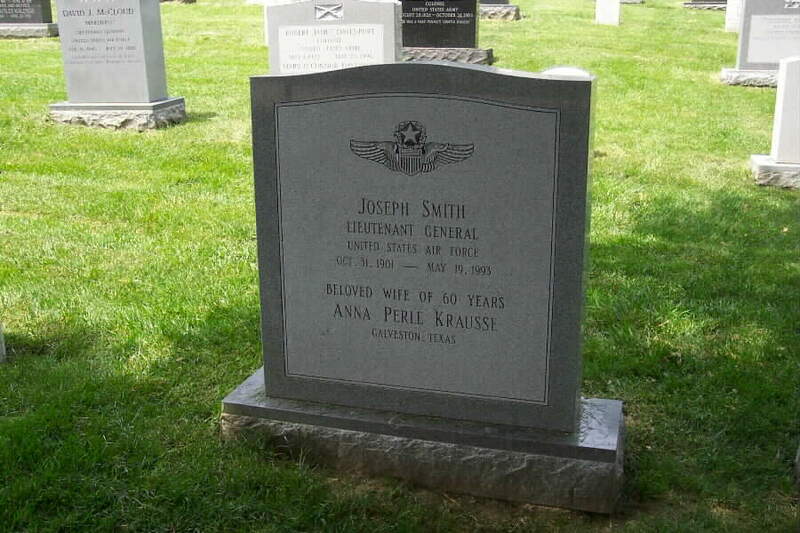 Anna Perle Smith, 96, who was the wife of an Air Force lieutenant general and helped found the Arlington Ladies, a group of women who assist families during burials at Arlington National Cemetery, died July 4 , 2011 at the Virginian retirement community in Fairfax City. She had a stroke. 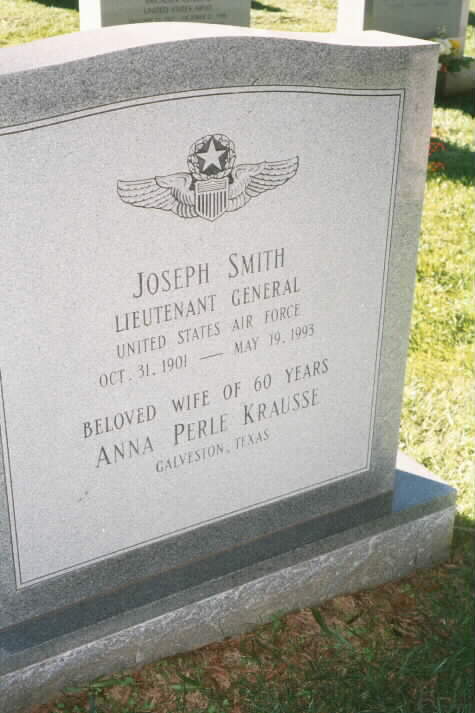 Mrs. Smith was born Anna Perle Krausse in Galveston, Tex., and lived for part of her childhood in Haiti, where her father was stationed with the Marine Corps. She and her husband, Joseph Smith, were married in 1933 and first moved to Washington in about 1940. In the late 1940s, Mrs. Smith and several other wives of Air Force officers helped form the Arlington Ladies. The group still assists at graveside services at Arlington Cemetery. In the early 1950s, Mrs. Smith helped revise two guides for military spouses, “The Army Wife” and “The Air Force Wife.” After settling in Georgetown in 1957, she coordinated a committee to make needlepoint cushions for the Air Force Academy’s chapel in Colorado Springs. Survivors include two children, Joseph Michael Smith of Seneca, South Carolina, and Sandra Smith O’Keefe of Alexandria; four grandchildren; and five great-grandchildren.